Stars from Nick Jr. UK's PAW Patrol will be visiting and meeting fans in Cardiff this November as they help celebrate the switching on of the city's Christmas lights! Christmas will officially start in Cardiff on Thursday, November 9 when the city centre will transform into a winter festive wonderland for the Welsh capital's big Step Into Christmas event! Like recent years, rather than just switching on the lights, the capital will undergo a spectacular transformation with a cornucopia of Christmas characters, music and entertainment to guarantee THREE hours of unadulterated yuletide joy. And that includes visits from PAW Patrol characters Skye and Rubble from Nickelodeon's hit preschool series, PAW Patrol, as well as beautiful Cairngorm reindeer who will be with Santa in their pen at the bottom of St Mary Street. As well as that, Admiral's Winter Wonderland will open on the City Hall lawn, the shops will kick-off their late-night shopping alongside the Cardiff Christmas Market and there will be 180 minutes of free festive family fun. What time will the lights be switched on? There is no official ‘switch on’ for the city’s lights this year but they will all be shining in time for the big Step Into Christmas event on Thursday (November 9). They will gradually start to twinkle as the night darkens. Cardiff Council wants to guarantee far more than just a three-second light switch on, instead providing three hours of entertainment in a free street festival instead. The celebrations kick off at 4.30pm and go on until 7.30pm. It's a FREE event (although some activities may incur a charge). Where can I see the PAW Patrol characters? 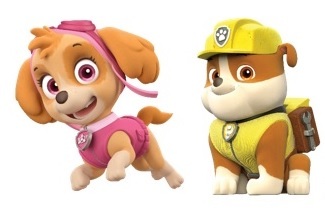 Skye & Rubble from PAW Patrol will appear at intervals outside The Old Library, opposite St David’s Hall. Is there any other entertainment? Yes! Watch out for Wonderbrass, Cardiff’s biggest, boldest, brassiest band, celebrate 25 years of making music in South Wales and beyond as well as the Winter Wonderland Birds - huge, illuminated, beautiful Christmas Birds light up the streets with their feathery wonderment. There will also be panto dames, Spark - a mesmerising, unmissable street show combining fantastic drumming and LED lights and The Three Kings - stilted giants from the East. There will also be The Glitter Miners, The Glitter Belles and Giant Baubles. When can I go ice-skating at Winter Wonderland? The Admiral ice-rink will open on the same night and this year the roof is back, allowing skaters to enjoy the skating experience, come rain of shine. After one of the wettest winters on record last year, organiser Sayers Amusements are reducing the risk of people missing out on skating sessions by looking to keep skaters super dry with a clear span roof and night sky lights. The only way to see Cardiff this Christmas is from the top of the Big Wheel! From the top of the wheel passengers will be able to spot sights like Cardiff Castle, Bute Park and the soon to be Principality Stadium. No advanced booking necessary, simply purchase your tickets from the box office prior to take off. A host of traditional children’s rides surround the ice rink too. Can I get some shopping done? The Christmas Market will officially open and stay open until December 23 when over 200 talented artists, crafts people and food and alcohol producers from across Wales offer an array of gifts such as Welsh slate, crafted candles, tasty cheeses, fruit wines and liqueurs, flavoured vodkas and gins, silver and enamel jewellery, pottery and original artwork. You will be able to find something for everyone on your Christmas gifts list whilst enjoying a cup of hot mulled wine as you browse! Full information about Cardiff's Step Into Christmas event can be found here on the official Visit Cardiff website. For PAWsome PAW Patrol videos, activities and games, visit NickJr.co.uk! Follow NickALive! on Twitter, Tumblr, Google+, via RSS, on Instagram, and/or Facebook for the latest Christmas on Nick Jr. UK and PAW Patrol News and Highlights!